Barbiturates (barbs, blue angels) are the most well-known hypnosedatives, drugs which calm people down (sedative) and in higher doses act as sleeping pills (hypnotics). Barbiturates come in the form of tablets, ampules, suppositories, solutions or commonly as coloured capsules. Barbituric acid was originally discovered in Germany in 1863 by von Bayer. It was named after the day on which it was found, St Barbara’s Day. Barbitone was developed later and marketed as a medicine in 1903. Since 1903 a large number of barbiturates have been manufactured under a variety of names. Those with a short duration if action which are used as sleeping pills are the ones most frequently misused for their intoxicating effect. They include Tuinal, Seconal and Nebutal. Sedatives and hypnotics are Prescription Only under the Medicines Act. This means that they can only be sold at a pharmacy, in accordance with a doctor’s prescription. All the misusable barbiturates, others from the same class of barbiturates, others from the same class of barbiturates and the sedative methaqualone are in class B of the Misuse of Drugs Act. Their unauthorized production, supply or possession are offences. It is also an offences to allow premises to be used for supplying or producing these drugs (see ‘Drugs and the Law’). 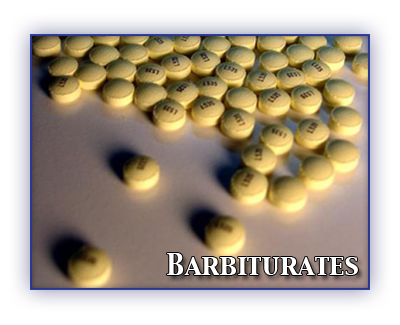 Barbiturates which are available for non-medical reasons have usually been stolen from medical supplies or are obtained on prescription and either not used according to prescription, or passed to some other person. In the medical sector the use of barbiturates declined sharply from 24.7 million NHS prescriptions in 1968 to 8.8 million in 1973, During the late Seventies and early Eighties, barbiturates, especially Tuinal and Nembutal capsules, were commonly available on the illicit market. However, prevalence in both sectors appears to have declines dramatically in recent years. Barbiturates are usually taken by mouth, occasionally recreationally with alcohol, but users may also prepare the powders for injection. Barbiturates depress the central nervous system in the same way as alcohol. Effects usually last for 3-6 hours: small doses (one or two tablets) usually make people feel relaxed, sociable and good-humored. With low doses, as with several other drugs, t is possible to ‘steer’ the effects to some extend, but with larger doses this becomes difficult and the sedative effects predominate. Anxiety, hostility and depression can result. Injected into a vein, barbiturates have an almost immediate effect, producing feelings of warmth and drowsiness. Breathing can become dangerously depressed. The ratio between ‘therapeutic’ and ‘toxic’ amounts (’therapeutic window’) is dangerously small and can cause death by respiratory depression. Besides the usual hazards associated with injecting, barbiturate injectors run an increased risk of overdose, gangrene and skin abscesses. Heavy users are also susceptible to pneumonia, hypothermia and repeated accidental overdose. Use of injected barbiturates is probably the most dangerous form of drug use. For women prolonged regular use in the later stages of pregnancy can result in withdrawal symptoms in newborn babies. Avoid injecting. Avoid mixing with other drugs. After regular use, tolerance and psychological dependence are likely to develop in any sedative but the danger with barbiturates is that the amount needed to cause respiratory failure increases relatively little. Serious problems of physical dependency are unlikely, but withdrawal effects can include irritability, fainting, nervousness, nausea and convulsions. Sudden withdrawal from very high doses can even be fatal. Medical advice is essential.